Still holding on to the on-the-cob popping corn? Here are two easy ways to prepare the most delicious popcorn you will ever taste. Remove decorative husk at top of cob. Place 1/2 – 1 whole cob in a brown paper bag, lunch bag size works well. Roll down top of bag to secure. Pop on high 2 1/2 – 4 minutes or until popping slows. Salt and butter to taste. For best results, pop no more than one cob at a time. 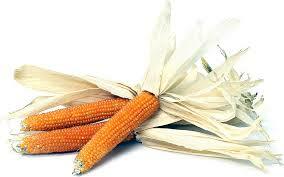 Take a spoon to a row of kernels to finagle them out of the cob. Now that you’ve made a space, you can either easily push out the rest of the kernels with your thumb or continue using the spoon as desired. Place 1 tbsp oil of choice in the bottom of a heavy pan with lid. Heat oil until one kernel dropped in pops. Then, add the remaining kernels and cover with lid. Move pan around on stove burner gently to prevent popcorn from burning. Pop until popping slows dramatically. Remove from heat, butter and salt to taste. If using two cobs at once, use 2 tbsp of oil. This entry was posted in Recipes and tagged on the cob popping corn, popcorn, vessel for butter and salt by Jennifer Moore. Bookmark the permalink.